The solar heated stock tank project has been a good success with quite a few people building them and reporting good results. A solar heated stock tank. The one remaining problem is that there is still a significant amount of heat loss out the drinking opening, and when you get extended periods of no sun and lots of wind and cold, there can still be enough ice accumulation to be a problem. BUT, it looks to me like Art has worked out a good solution to this problem. 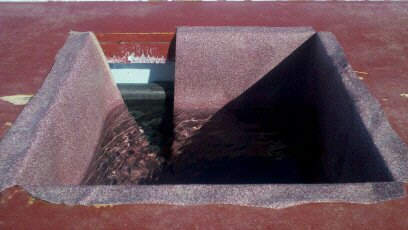 Art uses canvas awning material to make a sort of shield that reduces heat loss from the large open water surface down to just the area of the drinking hole itself -- see the pictures below. 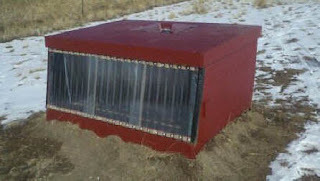 Art reports that with this technique the tank can go several days of sunless, cold, and windy Wyoming weather without a problem. Ice still forms in the drinking opening itself, but the horses can easily push the ice out of the way and get to the water -- the canvas is soft enough and slick enough that the ice does not freeze to it. Using canvas shield to insulate the water surface. Thanks very much to Art for sending this in! 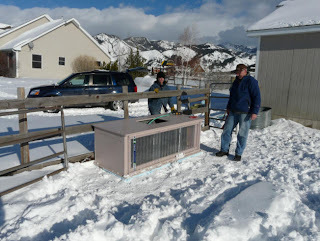 I read this with great interest, we don't get anything like your temperatures here but our pig troughs feed regular. Just a suggestion, how about putting a football (sorry soccer ball :-) ) in the opening, if it's large enough for the horses to push it out of the way it will spin in the wind and prevent ice forming. I've never tried it (yet) but I'm assured by one who has that it works. I'll talk to my horse owning neighbor about putting balls in water -- we might try both solutions. This five gallon waterer has a "floating poly lid", but I didn't see it in the advertising materials. Apparently thirsty horses are smart enough just to push down on it to get water. The floating lid seems like a good idea -- certainly worth a try. I'll add it to the collection.